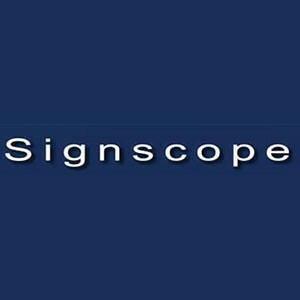 Signscope operate from 70,000 sq foot premises in Ramsgate, and we produce every aspect of manufacture in house which ensures high standards of quality. Using state of the art manufacturing we create all kinds of architectural signage, and graphic displays. Our team of project managers and logistics crews ensures that the internal and external signage is installed within correct timescales wherever the project is taking place â we cover the UK and mainland Europe. We are currently involved with manufacture, installation and maintenance contracts with a variety of major clients including; High Street retailers Banking sector clients (Santander roll-out of new identity to 300 sites currently) Motor sector (VAG group, Peugeot Harley Davidson etc) Restaurants and Hospitality (Burger King and Krispy Kreme) Supermarket and general Merchandise Stores (Waitrose, JLP, Simply Food, Hub Retail etc) Further to our manufacturing capability, our sister company Blaze Maintenance provides nationwide planned or reactive maintenance for all signage. Working alongside each other we are committed to providing a comprehensive service for our clients long term image maintenance needs.